Knauf AMF Performance Ceilings have fast become the ceiling material of choice for new modern hospitals, healthcare facilities and refurbishments. Our expertise in delivering high quality, sustainably manufactured, health conscious acoustic ceiling systems allows us to provide a solution for all healthcare situations. Quality acoustic design and aesthetics can enhance patient comfort and have a positive effect on patient recovery times. Hygena treatment for resistance to fungi and bacteria. Suitable for PC1 and PC2 laboratories. Superior noise reduction of NRC 0.70 - 0.90. Excellent sound attenuation of 28dB - 42dB. High light reflectance of up to 88%. Humidity resistance up to RH95% to RH100%. Up to 30 year limited manufacturer’s warranty. Tested to ASTM G 21/G 22 for resistance to fungi and bacteria. Achieves resistance to bacterial strains of Bacillus subtilis, Escherichia coli, Staphylococcus epidermidis, and Saccharomyces cerevisiae. Achieves resistance to fungus strains of Aspergillus niger, Paecilomyces variotii, Gliocladium virens, Penicillium funiculosum and Chaetomium globosum. Tested to 14644-1:1999 for Clean Room performance. Achieves ISO Class 3 for THERMATEX Aquatec and ISO Class 4 for THERMATEX Acoustic. ISO Class 3 is defined as having max. particle emission of 1,000/m3 of air (>0.1μm). ISO Class 4 is defined as having max. particle emission of 10,000/m3 of air (>0.1μm). Tested to ISO 16000-3:2001 and ISO 16000-6:2004 for VOC emission. Achieves ‘suitable for indoor use’ as per the German AgBB-Scheme. Achieves emission rating of 0.0064mg/m3 defined as ‘low emitting’ by having less than 0.009mg/m3. Tested to ASTM D-2486 (modified) for Scrubbability - 2,000 cycles. Tested to ASTM D-4828 (modified) for Washability - 200 cycles. Clean panels with water or a mild detergent solution. Wipe or spray surface with a suitable disinfectant cleaning agent and dry with a soft cloth. All THERMATEX ceilings can be dusted with a dry cloth and washed with a damp cloth. Manufactured with electricity produced from 100% renewable energy as per carbon footprint report. Bio-degradable and fully recyclable at end of life. Bio-soluble mineral wool with bio-degradable acoustic fleece surface finish. Manufactured to ISO 14001 for Environmental Management audited by TÜV Germany. up to 34% Total recycled content. up to 21% Post-consumer recycled content. up to 16% Pre-consumer recycled content. Up to 10 Year manufacturer’s warranty with THERMATEX ceiling tile. 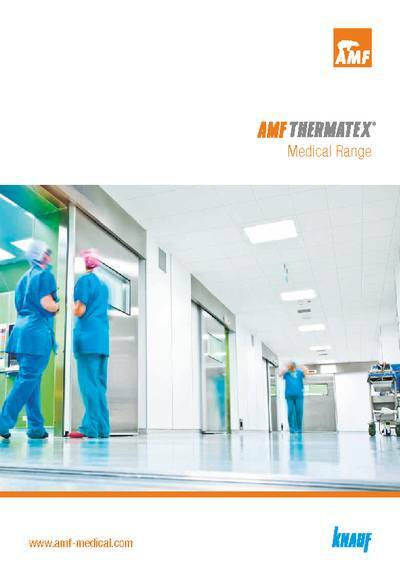 Up to 30 Year manufacturer’s warranty with THERMATEX and VENTATEC ceiling grid.